Researchers in the University of Minnesota’s College of Science and Engineering have developed a new noninvasive system that allows people to control a flying robot using a brain-computer interface. The study has the potential to help people who are paralyzed or have neurodegenerative diseases. The noninvasive electroencephalography (EEG) technique records electrical activity of the subjects’ brain through a specialized EEG cap fitted with 64 electrodes. During the study, the subjects involved faced away from the quadcopter and were asked to imagine using their right hand, left hand, and both hands together. This would instruct the quadcopter to turn right, left, lift, and then fall, respectively. The quadcopter was driven with a pre-set forward motion and controlled only by subjects’ thoughts. The subjects were positioned in front of a screen that relayed images of the quadcopter’s flight through an on-board camera. Brain signals were recorded by the cap and sent to the quadcopter over Wi-Fi. After several training sessions, the subjects were required to fly the quadcopter through two large rings suspended from a gymnasium ceiling. A number of statistical tests were used to calculate how each one performed. 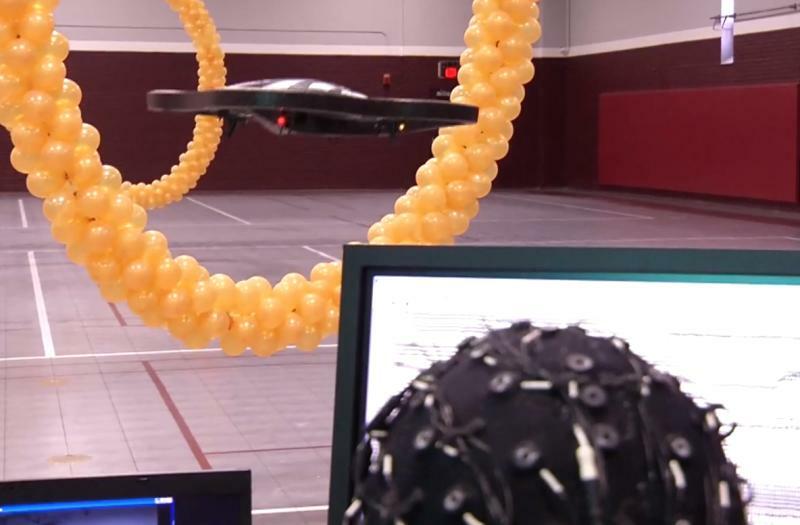 A group of subjects also directed the quadcopter with a keyboard in a control experiment allowing for a comparison between a standardized method and brain control. The University of Minnesota study was primarily funded by the National Science Foundation (NSF).